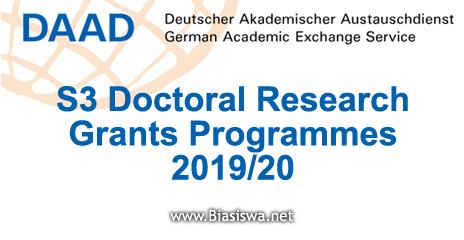 Germany DAAD Scholarship for S3 Doctoral Research Grants Programmes 2019/20 - DAAD Scholarship for S3 is now open for applications. These research grants are available to pursue doctoral programmes in Germany. Scholarships are available for foreign students. The aim of this grant programme is to support doctoral projects in Germany. Degree Level: Scholarships are available to pursue doctoral research programme. Eligible Nationalities: Scholarships are available for foreign students. Excellently-qualified young academics and scientists who have completed a Master's degree or Diploma, or in exceptional cases a Bachelor's degree at the latest by the time they begin their grant-supported research. For applicants from the fields of human medicine, veterinary medicine and dentistry, other regulations are applicable. Please refer to the leaflet "Additional information on DAAD Research Grants for applicants from medical fields". Two recent references from university teachers which provide information about your qualifications (hand-signed, no digital or scanned signature). Please regard the instructions given on the tab "Submitting an application".